I am a fan of small changes that open up big opportunities. I’m also a fan of reuse, and leveraging code in multiple apps or scenarios. And those of you who’ve known or read my blog for any length of time also know that I’m fond of talking about Community Megaphone, which is my current case in point for reuse. This is just one of many templates you can use to construct your REST URL queries. Now, instead of just a wall of text, readers get an instant sense of where a given event is located, so they can more easily decide which ones to attend. Adding the maps to the RSS feed was easy…but during the process, I realized there were a couple of issues with the implementation. Requesting the map tiles via the REST Imagery API is very simple…but if you simply dynamically construct the URL using latitude and longitude parameters and hard-code the Bing Maps API key in the client-side code, then you’re exposing access to your Bing Maps key. In theory, since you must provide a URL when setting up your keys, someone might not be able to use your key on another site. Still…call me paranoid, I’d rather not expose the information if possible. 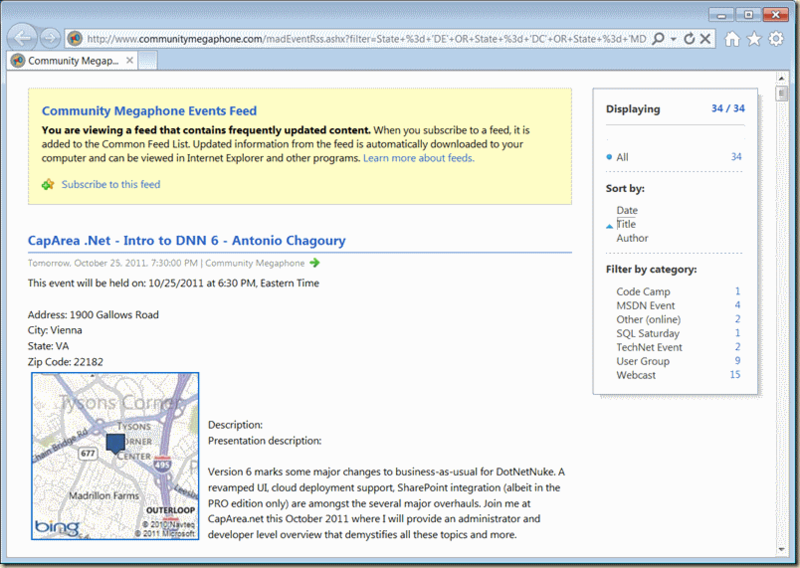 As importantly, while the reports page is available only to site administrators, and thus has very low traffic (meaning no worries about exceeding any API limits), the RSS feed gets a great deal more traffic, so simply embedding the URL for a given map tile query would result in many more hits to the REST service for a given event listing. Depending on the type of maps account you have, that might exceed the threshold requiring you to pay to use the API. After grabbing the contents of the querystring arguments, and verifying that they exist, the first thing the code does is attempt to get image bytes corresponding to the provided event ID from the cache. If the bytes are cached, we can skip calling the REST service, and just need to send them to the client (more on that in a minute). If the bytes aren’t already cached, the code hits up the database for the row corresponding to the event ID provided, and grabs the latitude and longitude values, then constructs the REST URL using these values, along with a static zoom level of 13, a static argument for a Road map (you could easily make either of these choices dynamic), and my Bing maps key. Then using an instance of WebClient, the code calls DownloadData for the constructed URL and returns the results as a set of bytes, which are then cached for one month (the tile image is pretty much static once the event has been geolocated, and I specifically dump the cache if the event information gets updated), which greatly reduces the number of API calls needed, as well as preventing unnecessary calls to the database. Whether the bytes are obtained from the cache, or from the REST service, once we have them, they need to be written out to the client. Here’s where things got a little tricky, since you need to do several things just right in order for the images to display properly and actually be treated as images of the correct type, and there are some additional hurdles when it comes to PNGs. Note that one of the first things the ProcessRequest function does is set the request’s content type to “image/png”. This tells the browser that you want to treat the resource its downloading as a PNG image. But that alone isn’t enough. You still need to make sure the actual image is sent in the correct format, which we do by loading the image bytes into an instance of the Bitmap class by way of the MemoryStream class (more on the why of this in a moment). Once we have the bitmap instance, we call its Save method, passing in another MemoryStream for the output, and the argument ImageFormat.Png to designate the image format we want to use. Then we call WriteTo on the output stream to write the output to the Response object’s OutputStream object. Finally we call Response.End to signal we’re done. With the HttpHandler complete, I just replaced the code that generated the REST URL in the Reports page and the RSS feed with a call to the handler, and everything worked splendidly. So, what about all these MemoryStreams? Are these really necessary? Well, when I tried saving the bitmap directly to the output stream as a PNG, I got the error “A generic error occurred in GDI+” (very helpful, I know). Bing to the rescue, helping me locate a post by Rick Strahl from way back in 2006 (and he has a related post here), which holds the answer in the comments that PNGs require a bi-directional stream, which is why we use the extra MemoryStream instances above. Another hitch that I ran into was that while it worked fine to embed the images in the reports page via a relative URL, that didn’t work for the RSS feed, since most of the time the RSS isn’t being read directly on the website. I ended up manually building up the absolute URL in code using various properties from the Request object. I’m fairly certain that there’s probably a more elegant and succinct way of doing it, so if any of my kind readers have suggestions on that point, please share them. Enables reuse within the Community Megaphone application, without worrying about the location information, accessing the database, etc. Any pros or cons I’m missing? I welcome feedback and/or suggestions on the code above, as I’m sure there’s always room for improvement and optimization. 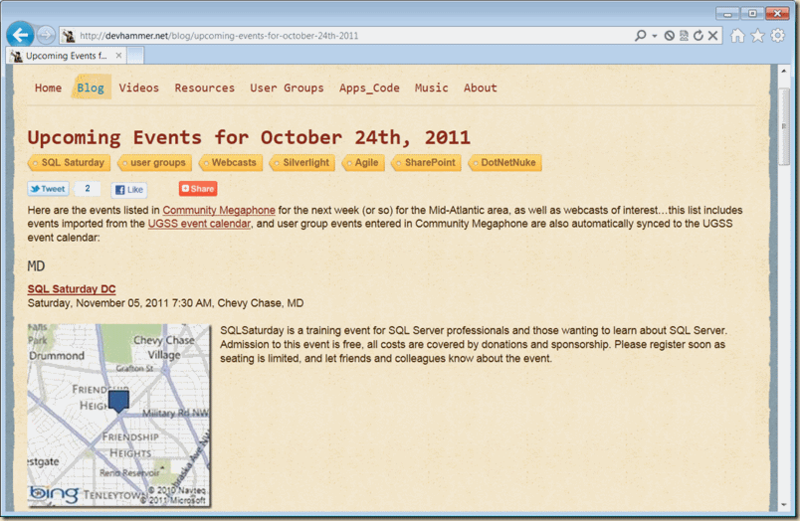 What started as a way to optimize performance by substituting static resources for active content led to a fairly straightforward way to leverage the Bing Maps REST API to provide additional information for visitors to Community Megaphone, whether they’re finding out about events on my blog, or via the RSS feed. But there was an unexpected bonus as well. Many feed reader applications will represent a given post with the first image that they find in the post, so by adding the images to the feed, I can automatically take advantage of that. For example, I created a simple application using the FollowMyFeed app generator for Windows Phone 7 which reads the RSS feed from my blog and Community Megaphone, and displays them nicely formatted on the phone. To the left, you can see a screenshot from the Community Megaphone feed view in the app. The great thing about this is that I didn’t have to do anything special to make this happen, beyond adding the map tile images to the RSS feed. An easy-to-use API, more information for site visitors and RSS subscribers, and bonus cost-free reusability in mobile apps, all adds up to a major win for some pretty straightforward code. Do you have similar experiences with APIs that gave you big wins for a small amount of code? Feel free to share them in the comments! Really cool, though I feel like there must be a more efficient way to build the absolute url–I’ll let you know if I think of one. This post got me excited for Wherecamp! Glad you like it. I agree on the absolute URL, and the part that bugs me is that I’ve been doing this long enough that I have probably even written code that does it more elegantly, and simply managed to forget how. Clearly I didn’t blog it, though, because that’s how I usually end up remembering such things…using the web as an extension of my brain. An added laugh…I went back to the code that generates the RSS feed and realized that I’d already had code in it to create the base URL for any relative links. Nothing like writing the same code twice and not even realizing you’ve done it. Ah well, at least I was able to save a few lines of code once I removed the redundant stuff. to it? This is the only piece of information that is currently not in the feed. To retrieve it you have to go back to the Community Megaphone website. Try the RSS feed now. And thank you for the feedback. I didn’t even realize that I wasn’t including the event website…a peril of staring at the same code for a long time…easy to miss stuff. So I went ahead and added the website to the feed, and it’s there now. Hope that will save you some effort. LOL…thanks for reminding me…I’ve been buried in email, but yes, I owe you and David a response on that. Will check with my wife and see when we can arrange it. I agree that the map images add a nice dimension to the feed (and the reports). I like the idea of a graphic for the online events a lot, but off the top of my head, I’m not sure of the best way to graphically represent an online event, and still have the image have some of the richness of the map graphics. I’m concerned that if it’s too simple a representation, it would stand out like a sore thumb compared to the maps. Do you have any suggestions for how the online events should be represented? Perhaps you could point out some graphics elsewhere that are close to what you have in mind? 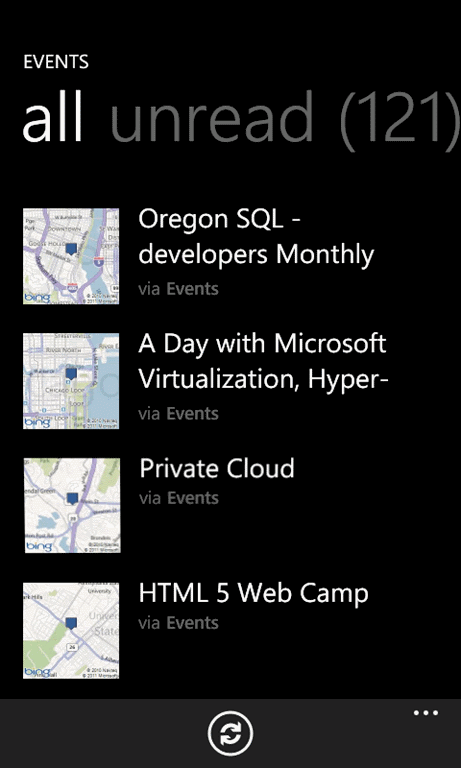 OK. Had a little time this morning, so I went ahead and implemented the icon for the online events. I just used the Community Megaphone logo, sized the same as the map tiles. Let me know what you think of this implementation. The community megaphone logo does jump out at you a little bit but I think it is fine. Ideally, it would be nice to have something that has some wording on it like “Online Meeting”. I found this graphic which is nice: http://blog.orgsync.com/wp-content/uploads/2009/10/online-meeting-150×150.png. Picking a good graphic is always hard. Also, do you have to be concerned about using a picture that has a copyright? That would limit the choices. Previous Previous post: Are you a Gadgeteer?